Affirmation of strengths. Suggestions for improvements. Writers act on feedback according to their own instincts, goals, and tastes. A note for the easy-going and free-spirited– sorry about all the rules. Over the past 20+ years the group has encountered a number of problematic behaviors. Each situation gave birth to a rule. The rules clarify expectations and allow us to get on with the writing and critiquing without fuss or conflict. We’ve found structure and boundaries makes dogs, kids, and groups happier. Meetings are bi-weekly on Sundays. Door opens about 1pm. After a few minutes of socializing and getting settled, critiquing starts no later than 1:10pm and ends around 4:30pm (occasionally later). We take a ten minute break about 3pm. Bring a beverage (and snacks or lunch) if you need them. We are not a drop-in occasionally, public, open-mike kind of group. Regular attendance is the norm. We’re a sizable group, consisting of productive published and unpublished genre writers. Membership is capped at 12. Sometimes we have a waiting list. Some members are an hour away and everyone’s time is precious. To ensure that we’re going to have enough critiquing to make the meeting worthwhile, an attendance “roll call” is emailed the week of the meeting. Please “reply to all” as soon as possible so that everyone can see how the meeting is shaping up. If you’re not sure, respond with a “maybe” asap. Let the group know if you’ll be late or need to leave early. A “recap,” a summary of attendance, is sent out a few days before the meeting. If something unexpected comes up after the recap, please call someone and/or email the entire group. Although we have a schedule (posted to the right), it’s not etched in stone. If there’s bad weather or not enough attendees or critiquing, we cancel and sometimes reschedule for the following week. Occasionally, when the group is collectively in an extremely productive phase, we schedule extra meetings. Typically if attendance/readings fall below a minimum is 5 attendees and 3 readings, we cancel the meeting. There are dues of a sort. We rent a private space in a public building which we pay for collectively each time we meet– $2-4 per person depending on how many people show up. If we cancel a meeting, we don’t pay. If a member didn’t attend, they don’t pay. Members might make the group aware of their preferred pronouns. Please refrain from wearing scent (perfume, aftershave, scented lotion, etc) to meetings because some members have allergies. Members should make us aware of any special needs/disabilities/allergies, etc. that could be accommodated. Please silence cellphones during critiquing. Manuscripts are not emailed in advance. Here’s the thinking–we don’t read manuscripts beforehand which is a form of homework. The only homework for this group is to write your own WIP. (“Homework” is also problematic for the group in other ways–it requires deadlines, deadlines are missed, people come to meetings unprepared, etc. and the group leader has no desire to police members.) Instead, we read aloud from printouts distributed at the meeting and comment and discuss on the spot. New members generally find the pace extremely challenging at first, but eventually adapt. However, we make no claim that this is a perfect method or it works for everyone. Sorry. Extra printouts are appreciated (but not required) so people can follow along. Printouts should have page numbers, preferably the actual page numbers from the novel so that people have a sense of where a piece fits into the whole. Save paper. Ask critiquers to share. Printouts may be single-spaced and/or on the back of used paper. 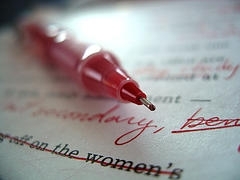 At the meeting, critiquers put their name(s) on their copy, and are encouraged to mark punctuation errors, misspellings, typos, repeated words, and other issues using these proofreading symbols. They should refrain from writing other comments. Seriously. Don’t make the group leader say something, because she will. All comments must be spoken aloud at the meeting. The thinking: First, a critiquer cannot simultaneously write diplomatic comments and attend to the reading in progress. (Notes to jog your memory should be written on your own notepaper where you can say whatever you want, however you want to say it without worrying about being diplomatic or understandable). Second, comments shouldn’t be private, and a critiquee shouldn’t have to wonder later what a cryptic comment means and who made it. Comments should be spoken aloud so everyone can learn, agree, disagree, augment, and/or discuss. Additional comments shouldn’t later be privately emailed to a writer unless/until you’re friends. Avoid using red pens, please. Critiquers are not authority figures like editors or teachers; they’re fellow writers helping each other out. At the meeting, the writer does not read their own work aloud. Instead, a volunteer reads. The thinking: good dramatic reading can sometimes compensate for not so good text. That’s not helpful. In other words, we don’t critique the reading; we critique the actual words on the page. The maximum number of words that can be read at a given meeting is relative and depends on the number and productiveness of members for that particular meeting. Word count is determined by word processor. Generally, the limit is around 2000-2500 words. When we have less attendees and reading at a meeting, the max could be as much as 4000 words. There is no minimum. We make reasonable efforts to be flexible for publisher/agent/application/contest deadlines. The order of reading is set at the meeting’s beginning and it’s always longest to shortest–those with most words read first, so that we tackle the longest pieces first while we’re fresh. First timers may go first if they’re nervous. Any writer bumped from a meeting because of time constraints gets priority at the next meeting. Once a reading is concluded, the critique begins with a round of positive comments concerning the piece’s strengths called “the circle of joy.” Competent critiquers should be able to identify strengths in any manuscript. Everyone should make an effort every time to contribute to the joy. Joy should never be skimped on, even if you feel like you give the same joy to a writer every time. Just because you expressed joy about an element doesn’t mean you can’t also have suggestions for strengthening it. Joy isn’t limited to the beginning; more joy may emerge during the critique and at the end. Critiquers must not phrase suggestions as questions. Seriously. Although some critiquing methods favor a question method, we’ve found questions cause critiquees to instinctively respond with counterproductive justifications and explanations which eat up the group’s limited time. Questions work well for literary fiction and is designed to generate discussion about creative choices. Members of this group prefer specific, practical help in the form of concrete suggestions. PLEASE don’t put the group leader/moderator in the position of having to rap your knuckles when you phrase suggestions as questions. Because material can only be read once, most members avoid reading first/rough drafts. The critique of a novel typically happens scene(s) at a time over the course of many meetings. Most writers read every scene, but it’s not required. Critiquing is not the same as immersive reading of a book; members can still critique if they’ve missed a lot (occasionally this approach even generates better critiques). Novelists briefly summarize what’s already happened before they begin reading (or provide a typed sheet with a paragraph of summary or a story blurb, list of characters, etc.). Like all critiquing methods, the scene-by-scene approach over many meetings is imperfect. Its strength is that it generates a substantial amount of specific, detailed feedback at the micro and macro level which members of the group find consistently useful for their own continued improvement. Many members supplement this approach by having beta readers outside the group (or volunteers from the group) evaluate the entirety of a revised and rewritten novel before submitting it to agents/editors. When a writer first begins to bring a new novel to be critiqued, they do not tell us the story beforehand or describe their novel other than to tell us the genre. Outlines, synopses, summaries, query letters, and blurbs can be submitted for critique at any point–before, midway, or at the end of the process of reading a novel. The writer decides whether they want to share an outline/synopsis/summary and at what point in the process. If story and plot are a personal weakness, it can be valuable to have an outline/summary/synopsis critiqued beforehand or in the early stages of a novel. Other writers prefer spontaneous reactions which are uncontaminated by foreknowledge. It’s entirely up to the writer. The group leader can offer advice, if asked. Members of the group should be actively writing and pursuing publication, but each writer chooses when and how often they get critiqued. Many members use the meetings as a personal bi-weekly deadline. Life happens, of course, but if a writer is never writing or being critiqued, membership in the group should be reconsidered. Writers may not submit a piece that has already been accepted for publication (and hence can usually no longer be revised). Writers are free to do whatever they like with feedback–implement it or ignore it. Writers decide later about feedback, on their own, after the meeting. They should not discuss their dilemmas or justify their choices during the critique. If, however, generally you decide to ignore most of our feedback, membership in the group should be reconsidered. Avoid repeating yourself and each other. If you agree with another’s comment, nodding takes less time then chiming in. Be considerate and gentle, yet professional. Be aware of your own personal preferences. Try not to critique based on what you normally read and like, but temporarily become a reader of that particular genre. Be nice, but also impersonal and objective. Avoid showing off how much you on science, history, or whatever topic. Writers should avoid the discourtesy of publicly dismissing other’s feedback. You may come to realize that considering dissenting perspectives helps you to better connect with more readers. Avoid vague judgments and sweeping generalizations which are unhelpful and sometimes even insidiously destructive. Always be specific–praise specific strengths, techniques, and passages; suggest fixes for specific passages, phrasing, problems, and weaknesses. Always encourage in the critique. Be constructive and tactful. Try to avoid overly enthusiastic fan gushing; it tends to stifle suggestions for improvement and it’s often dangerously misleading for the writer. Instead, lavish praise on specifics. Avoid blurting. Take a minute to consider a diplomatic phrasing of negative reactions. Avoid referring to characters or their actions as stupid or too stupid to live, or referring to another writer as a beginner. Offer concrete suggestions, options, and solutions, but avoid rewriting a story. Be aware of style. Help others develop their style rather than imposing your style on them. Avoid making jokes. Humor about someone’s writing can be particularly hurtful. Be patient. Be sensitive to different writing levels. Try to gauge comments appropriately. Avoid being completely uncritical on weak work or unrealistically harsh on polished work. No digressions into other topics during critiquing. What happens in critique group, stays in critique group! Seriously! Sharing any aspect whatsoever of critiquing or another writer’s ideas or work with someone outside the group (including a spouse or significant other) is strictly prohibited unless the writer has given permission beforehand. Writers who want help solving a problem or developing parts of an idea or story can request a “Plots ‘R Us” session (instead of a critique) in which the group brainstorms solutions for specific problems with plot, motivation, characters, etc. A writer can talk the group through the problem, or provide a written outline or summary. “Plots R Us” is, of course, no substitute for critique of the actual manuscript. 1. The limited critique is briefer and produces less feedback. Anyone may choose this critique, but it is mandatory for potential new members. The critique begins with a circle of joy in which each critiquer makes a single positive comment. That’s followed by a circle of suggestions–each critiquer comments on a weakness. Critiquers may pass, or just agree with a “ditto.” A weakness should be more or less a single element/topic. For example, a weakness might be “I didn’t understand the opening” or “I was confused about x because a and b.” Or “the character seems inconsistent. In the first scene, she said/did x and y; in the next scene, she said/did a, b, c.” Critiquers may include a possible fix in their one and only one weakness. 2. The everything critique is for veteran members who need and want any and all suggestions. The circle of joy is followed by free-flowing discussion of problems and suggestions. Potential new members may not read and do not participate in critiquing at their first meeting; they observe quietly to get a sense of how the group functions. (Think of this as a fairly painless initiation!) At the second meeting, potential new members may, but are not required to, be critiqued and critique others. Potential new members get a try-out period of six meetings during which they should submit at least a couple of pieces for critique. (Yeah, I know, enough already! But, sorry, we’ve had some unhappy experiences in the past, and we don’t like hurting people’s feelings.) A try-out period gives everyone a chance to see if we’re on the same page and if it’s going to work out. At the end, if everyone’s happy, the potential new member officially joins. If it turns out the group is not a good fit, it’s hoped that the writer will give up their spot without being asked, no hard feelings, so that someone else can join. The group leader reserves the right (which she exercises on rare occasions) to ask a writer to leave for not being a good fit, for never submitting material for critique, for not contributing to or benefiting from the group for an extended period of time, for ignoring rules, for rarely being able to attend meetings, or for engaging in other unacceptable behavior. There’s nothing the slightest bit personal about it. No spitting, hitting, or biting! When a writer finishes a novel, wins or places in a contest, gets an agent, or publishes a book or short story, or has some other writing success, we celebrate with a little party by bringing cupcakes and other snacks to the meeting. When a member hits the NYT bestseller list for the first time, they buy lunch for the group! Rules and procedures are frequently adjusted. Suggestions are always welcome. We can help you develop your own style and story. We can’t make writing decisions for you. We can’t teach you everything you need to know. We’re not teachers to whom you turn in rewrites until you get it right. We won’t tell you how wonderful your book is (that’s what mothers, spouses, and friends are for).